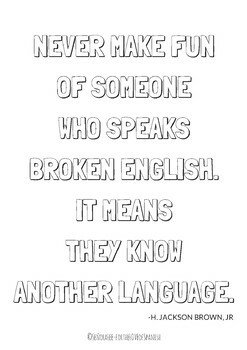 Foreign Language Poster | Promote diversity and acceptance of other cultures with this very important quote by H. Jackson Brown, Jr: "Never make fun of someone who speaks broken English. It means they know another language." I Teach Spanish - What's Your Superpower? Earn credits on Teachers Pay Teachers! Each rating and comment you leave for products you’ve purchased gives you TpT credit which you can use toward future purchases. Click on the green star above to follow me to keep updated of new materials for Spanish 1 and store wide sales! Most new resources are 50% off for the first 48 hours! TOU: This product is a paid digital download from my TpT store Senora Lee – for the LOVE of Spanish. Products are created for single classroom use only. Additional licenses must be purchased in order to share with other teachers and departments. This product may not be re-sold or distributed. Thank you for respecting copyright laws.